Peter T. Vogt is installed as Dean of Bethel Seminary followed by an open house at the seminary’s new Anderson Center location. 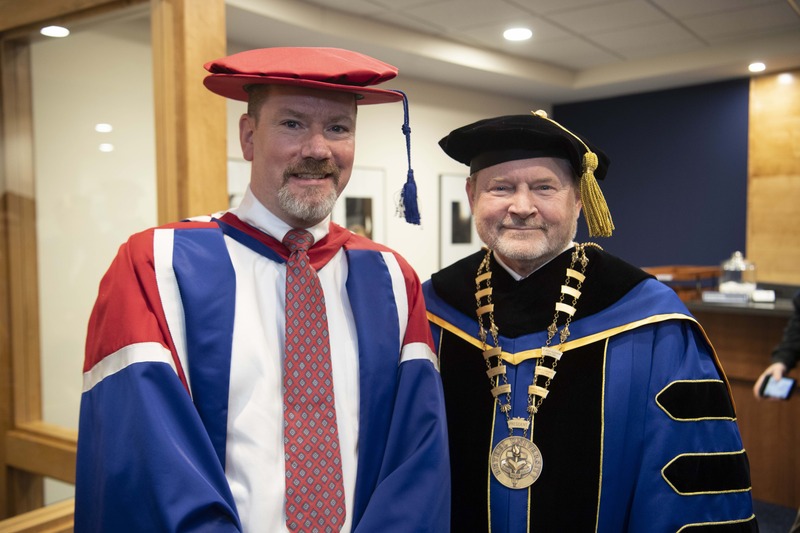 February 11, 2019 | 9 a.m.
Peter T. Vogt S’97, a former Old Testament faculty member, was installed as dean of Bethel Seminary on February 4. Vogt, left, stands with Bethel University President Jay Barnes before the service. On February 4 at Bethel Seminary’s new Anderson Center location, enormous glass windows showcased the snowy landscape outside, while inside was the warmth of a community celebrating new beginnings. Events included an installation service for Peter T. Vogt, dean of Bethel Seminary, followed by an open house in the new seminary space. Vogt has close ties to Bethel Seminary, graduating in 1997 with an M.Div. and returning in 2001 to serve as a full-time faculty member in Old Testament. In between, he earned a Ph.D. in Old Testament at the University of Gloucestershire in Cheltenham, England. 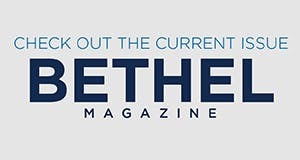 He has demonstrated leadership in a variety of settings, including service as a naval officer aboard the destroyer USS John Rodgers, and most recently as senior pastor of LifePoint Church in Maplewood, Minnesota. In a time of significant changes in seminary education both nationally and at Bethel, Vogt brings experience and energy to his new role. “We are convinced that Dr. Vogt is the leader we need for the seminary during this time of change,” says Randy Bergen, associate provost for the College of Adult and Professional Studies, Seminary, and Graduate School. Bethel Seminary develops and equips leaders who engage first in personal transformation, then go on to transform the world.